1 X KJ 2011 SVI Accererator clone 6"
Mods on this site squat here to mod. Wow thats really weak. The one I have I can't push the mechbox back by hand. Perhaps that is the solution? I need to see your mechbox "recoiling". Mine, the mechbox is held forward by the faux buffer mechanism which is in the stock and pushes the mechbox foward. There is no "recoil", even with its crazy 500fps spring. Perhaps your recoiling is the same issue I had with the air nozzle and hop unit? Nice review: In relation to the Inokatsu: There were 2 versions, Alu and Steel. I have the Alu version and wished I had the Steel one, but literally it was the last one for sale I bought it from Hawaii and shipped it to HK where it was then broken into pieces and smuggled into NZ. It clocks in at 8kg unloaded and around 10kg with box mag and rounds. Mine has been a loan "torture" gun for noobs , permanently set at 500fps to teach airsofters appropriate machine gun use. It is quite funny to watch players struggle carry the thing up a 2km hill. No issues after hundreds of thousands of rounds. I have had to change the piston once. 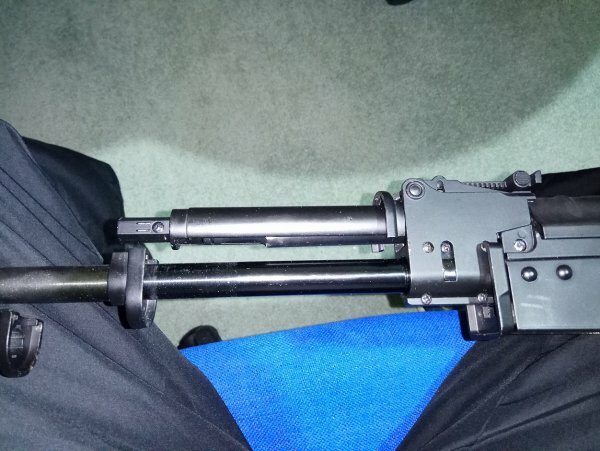 Compared with my A&K M60/M249/PKM and G&P M249s, the real strength of the inokatsu is the heavy duty motor and magazine, where debris can get into the mechanism and rounds would still come out. Whereas the M60s or M249s small amount of sand or foliage and would jam the feed mechanism. 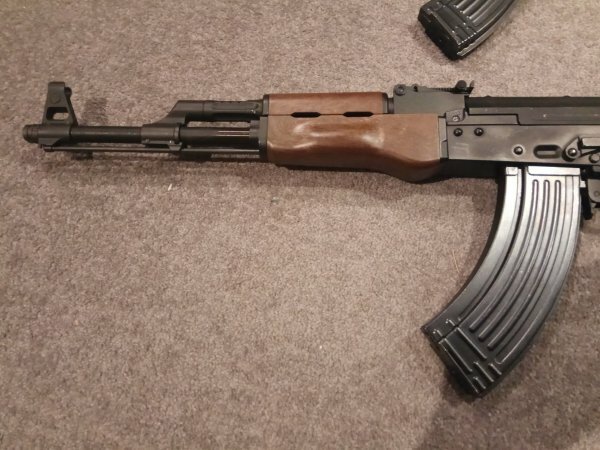 The weakest part is also the magazine housing, which is cardboard. I constructed a folded polycarb box for field use and over 8 years it has slowly disintegrated. Now I retrofitted an A&K M60 box mag shell so that will last a lot longer. Only thing that really affected this was the hop chamber and air nozzle fitment. Hop chamber is too wide, and the air nozzle it came with was too narrow, which means that the air nozzle would wobble and as soon as the autowinding mag was in tension it would push the nozzle out of airseal alignment with the hop rubber. To fix it I created a thing sleeve that holds the nozzle in place. Other than that its a workhorse. The rationale behind that is to decrease gas consumption in the blowback cycle. 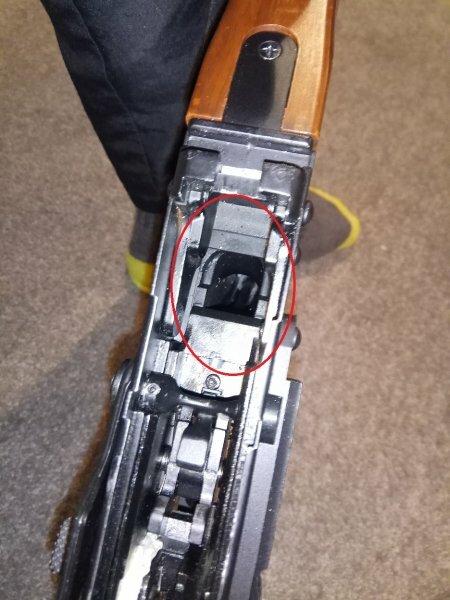 There are two springs which control the amount of gas which result in net rearward movement of the bolt carrier; the main recoil spring, and the nozzle return spring. A quicker rearward movement is a result of lightening of the mail recoils spring and the nozzle return spring. 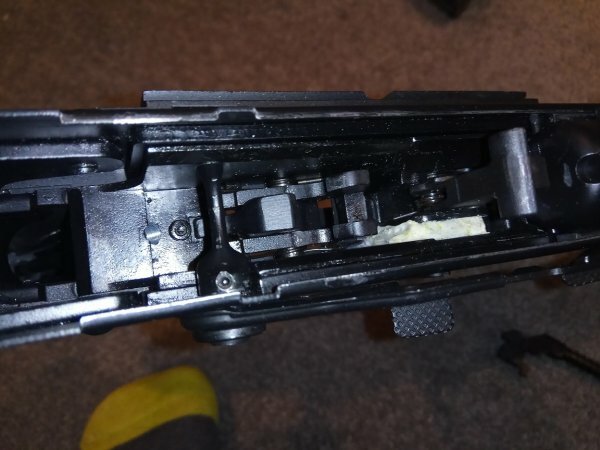 That will result in less effort and gas used to push the bolt carrier rearwards, shutting the gas release valve sooner, using less gas without changing the rate of gas flow in the system. But of course, as an open bolt system, the main recoil spring determines the striker force on the gas release valve, which will affect initial gas release impulse and will affect FPS if trimmed too much. Over lightening of main recoil spring may also result in cycling and reliability issue. Recoil will definitely be harder, and will affect the structure and buffering at the back of the receiver. So it is all a balance. Yes I did, ROF is lower. When you do it however, you gotta remember that on an open bolt, the impact force releases gas. So if you lighten that too much FPS will be affected. Funny you say that, pretty much Most WEs I would have to do the same sort of fixes to them anyways. It actually makes the WEs more flexible. For example because I need to do that tuning, I can max out gas efficiency, recoil, reliability, and power output where I would have trouble with say a GHK or a Marui. For cheaper, a WE get better performance overall. Great review! I bought mine recently, and its a fun gun. Shoots at 320-330fps at 27*C, which is bit low for my liking. However gas efficiency is very poor, I get 60 round/cycles out of a full charge. I proceeded to trim the main spring by 30% and stretched + trimmed the nozzle return spring by 40%, got around 80 rounds/cycles per charge, with a noticeable increase in kick. I found that the flute valve was being slammed forward during the cycle and hence resulting in low FPS, using an older and stronger WE flute valve spring to keep the flute valve in place , which increased the FPS. Its now shooting at 430-440fps. Due to the same issues around the hop rubber constriction it is causing a dispersion. The wobbly and misaligned barrel is also causing a number of accuracy issues. So I proceeded to shim the barrel, which brought the rifle back to the correct point of aim. I will be working on the hop rubber later today to get better accuracy. All in all, it does need a heavier barrel and a wood kit, which I will purchase at a later date. Aww shucks, more money to spend. Be cool to see how works. Marui's lack of international strategy lost out to WE's strategy a lot time ago. Japanese as a culture are far more conservative than the Chinese, and it translates to their business Acumen. Still, good news around the WE Browning MK3 even though I just bought a GP1935, I will probably pick up the Mk3 at a later date. I have been fitting old AWSS hop ups into the Browning and the Lugers as they don't have hops at all. WE, Y u no PPK, M1934? Its the old hop up, as mentioned in the video. Nah they are shutting down, mate was just down there yesterday. 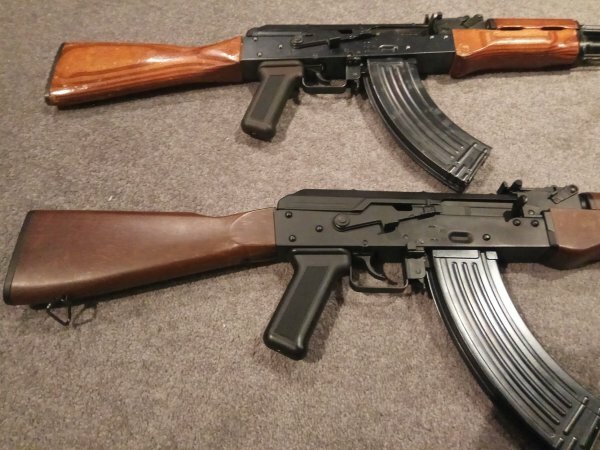 Above is a WE AK PMC, Below is the WELL Uses the traditional AK47 front sight, gas block and furniture. 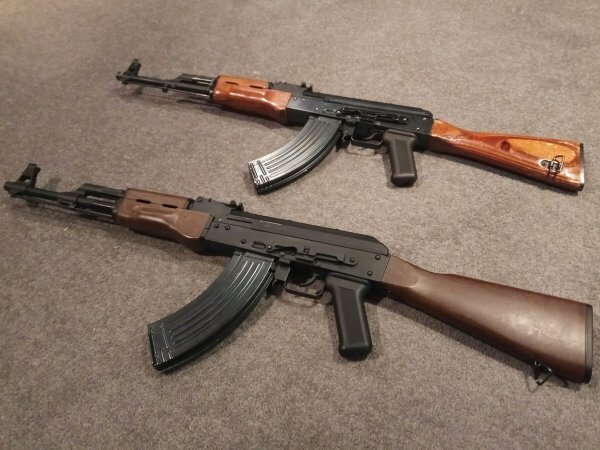 I added the AK47 thread protector (removed the AK74 muzzle break) Side by side comparison Note rear sight block and gas tube, reminiscent of marui AKs. Note triggers, the white putty is reinforcement added by me to strengthen the trigger box. Note the rectangular cut, similar to AEG receiver, but not quite. The pistol grip covers up the hole quite nicely. Anyone noticed they are selling everything at discount, and their website has very few products?